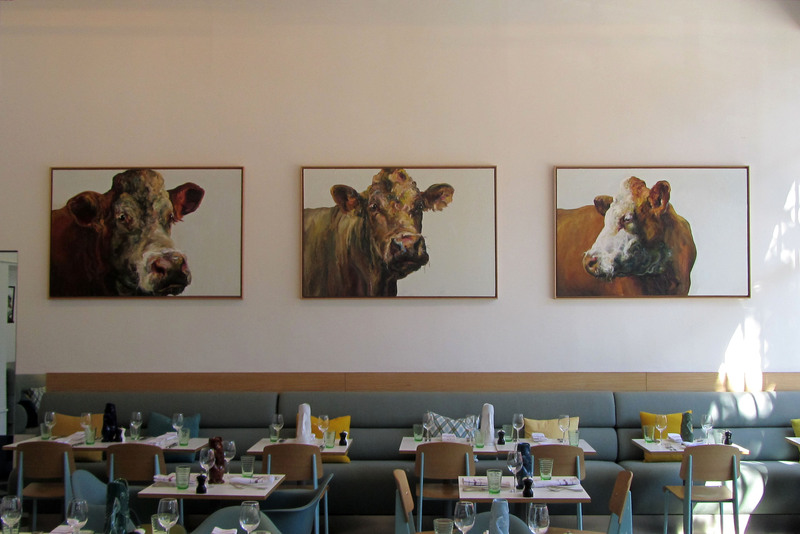 Jelly Green‘s cows are now installed at Kensington Place. The famous mural has been put into storage to make way for a new exhibition space to be known as The Art Wall. As Dominic observed, it’s less of a mural, more a mooral. Which is one way of looking at it. They are very direct, very ‘in your face’ as one of our customers described Jelly’s paintings. They are a face to face encounter, one to one, nothing else is important, no need for superfluous background. There’s a spark kindled by those magical, energetic brushstrokes, a spark of recognition. Face. Whatever the painter is looking for, he’s looking for its face. All the search and the losing and the re-finding is about that, isn’t it? And ‘its face’ means what? He’s looking for its return gaze and he’s looking for its expression – a slight sign of its inner life. And this is true whether he’s painting a cherry, a bicycle wheel, a blue rectangle, a carcass, a river, a bush, a hill or his own reflection in a mirror…When we have to stop before a finished painting, we stop as before an animal who is looking at us…An old story that goes back to the caves. 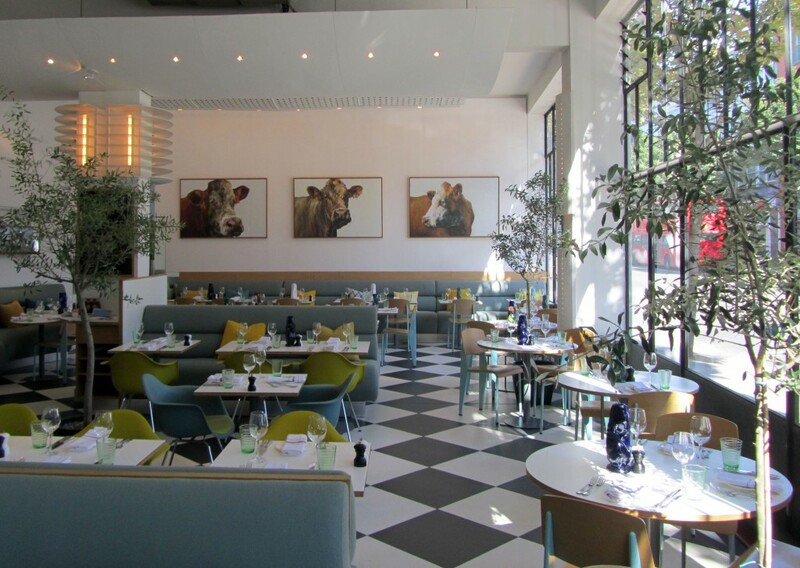 Next door in The Room, the Kensington Place private dining room, there is a display of some of Jelly’s smaller paintings, more playful than those magnificent beasts on the other side of the wall. You can sense that Jelly has stood amongst them and they’re just as curious about her as she is of them. 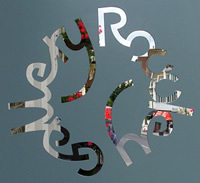 See more work by Jelly Green at The Rowley Gallery. 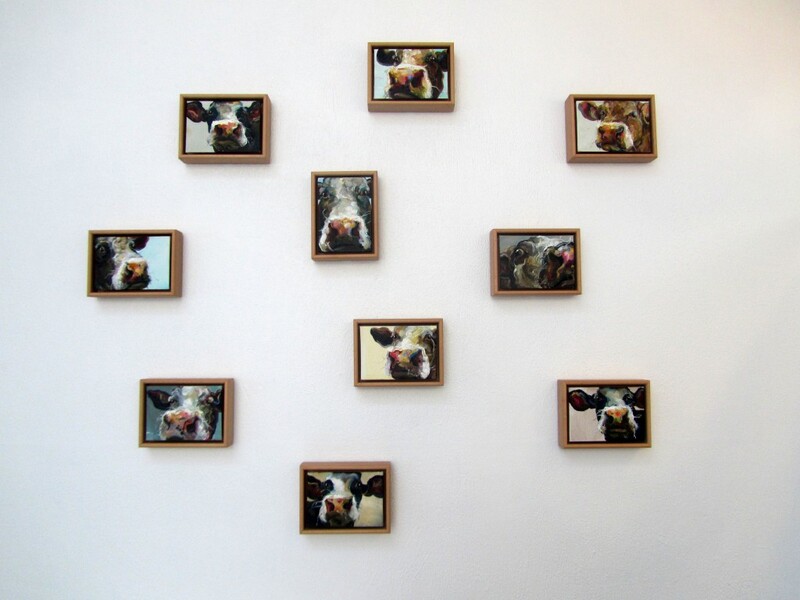 This entry was posted in Art, Cows and tagged Jelly Green, John Berger, Kensington Place, London, The Art Wall. Bookmark the permalink. These look so good on the wall. Cows are curious – and sniffy. I was alerted to this book by Gerry at That’s How The Light Gets In.